Size-exclusion chromatography separates extracellular plasma vesicles from protein/HDL. 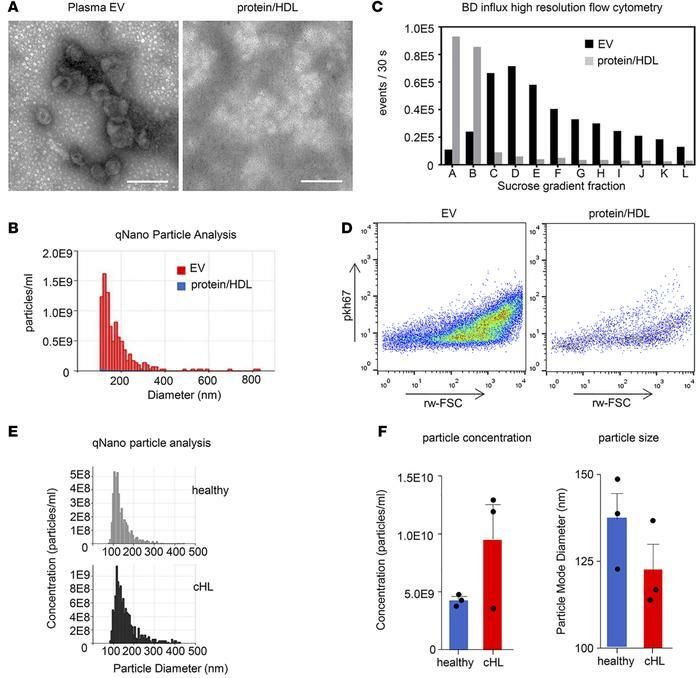 (A) EM images of plasma extracellular vesicles (EVs) and protein/HDL fraction after size-exclusion chromatography of 1.5 ml healthy donor plasma. Scale bar: 200 nm. (B) Particle analysis using qNano (iZON) of plasma EV (red) and protein/HDL fraction (blue). (C) High-resolution flow cytometry (BD Influx) of plasma EV (black) and protein/HDL fraction (gray) after pkh67 fluorescent labeling followed by sucrose gradient centrifugation. (D) Scatter plots of plasma EV and protein/HDL fraction corresponding with sucrose gradient fraction D, as shown in C. (E) qNano particle analysis of plasma EV from a healthy donor and a cHL patient. (F) Particle concentration and size using qNano. n = 3 healthy donors and cHL patients. Error bars represent mean ± SEM; dots indicate individual samples.